If you’re old enough, try to think back to the way teaching and learning was designed 40 or 50 years ago. The teacher was the “sage on the stage.” He or she had the subject information in their mind, and it was up to the teacher to make sure each student understood what was in the curriculum. Teaching and learning consisted of a lecture, note-taking, seatwork, using the textbook, maybe some group work, and at the higher level of education, some class discussion and debate. Students were also charged with doing homework independently as a form of practice, say in mathematics, but even in the other subjects, completing worksheets or review questions at the end of the textbook chapter acted as the reinforcement students needed to master the content. During these earlier days, students sat in rows. Teachers used the chalkboard to stress facts they wanted students to know. Some teachers incorporated a more Socratic method of classroom interaction where learning took place through the posing of questions which students would answer verbally or in writing. For the most part, education was “one size fits all.” Individual strengths, weaknesses, and interests did not come into play when learning was taking place. You either got it or you didn’t. Your scores on tests, quizzes, and projects comprised your grade with some modification for effort on your homework. This approach, put in place from the mid-19th century onward, seemed to be the dominant model for K-12 education until the passage of Public Law 94-142 in 1975. This law stated that children must be taught in the “least restrictive environment.” The area of special education and providing specialized assistance to students with disabilities was born. The current trend seen in some school districts towards “personalized learning,” where every student develops their own “individualized education plan (IEP),” is an outgrowth of its earlier expression in the form of special education. 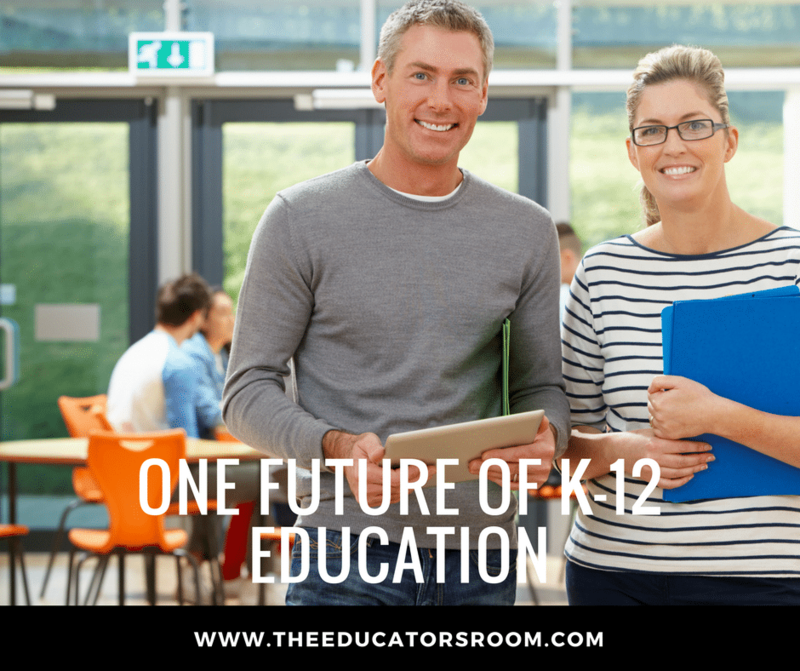 It would have been difficult for the K-12 teachers of the 1960s and 1970s to imagine the direction of K-12 education that we have seen in the past twenty-five years. In the early 1990s, the personal computer was just making its way into the business and science communities. As a reflection of those changes, middle and high schools across America began using computers as a way to process information. Business education classes replaced their typewriters with computers and monitors. Keyboarding included training in the use of word processing programs such as Microsoft Word and spreadsheets such as Microsoft Excel. Teachers began logging on to something called the Internet using slow dial-up modems, but it still allowed them to connect with academic, governmental, and commercial institutions worldwide. Teachers saw they could project images within their classrooms from museums, the White House, or remote villages located around the world. Students could begin to express themselves through writing, art, and video and share their product with a global audience, gaining insight from experts in almost every field. Not only would commerce and government be transformed by the ability to communicate at the speed of light globally, but education would be transformed as well. These early pioneers on the information superhighway would see their schools wired with every classroom connected to high-speed internet access, and eventually, computers and smart boards available for virtually every student and every teacher. Email would become the way to communicate with parents, colleagues, and administrators, and finally, in the 2000s, social media and television would blend to become the cause of political and social revolutions from Tahrir Square in Egypt to the National Mall in Washington, DC. These aspects of communications in education are now widely accepted though they are not ubiquitous. There are still rural communities and urban schools in the US and around the world where there is no internet access and where computers are not visible in the classroom. Budget cuts in education created a “digital divide,” where schools with fewer financial resources were unable to afford the necessary technology for every student. To fill the gap, many school districts embraced the “Bring Your Own Technology” (BYOT) movement, where instead of laptops, students would be permitted to use their own cellular device or smartphone to bring the world to their classroom. Even though this augmentation has its risks, school systems constructed policies that would discipline students sufficiently to allow them to use their own devices, thus achieving the goal of being connected to the wider world while externalizing the cost of access to the students and their families. Since the advent of computers, combining the human body with artificial intelligence has become the subject of a number of science fiction books and movies, but in this age of miniaturization and personalization of technology, this merging of the human and the artificial is not far off. In his Forbes.com article of November 2017, writer and futurist Sarwant Singh predicts that the human body will be augmented with computer chips that will enhance our senses of sight and sound. The body will improve with prosthetics and implants that will accelerate our movements and our thought processes. The process of business transactions will be incentivized through actions that are similar to video games, and just as Facebook’s algorithm can adapt to our likes and dislikes, our online experiences will become increasingly personalized. This entire process of integrating technology with the human body and the experience that arises from this marriage is known as transhumanism. The implications for transhumanism are as powerful now as the arrival of the Internet was in the 1990s. There are inherent risks as well: the violation of privacy, identity theft, fraud, and the acceleration of artificial intelligence that could lead to a “Terminator Scenario,” where computers become “smart” and take over their human masters. Still, change is inevitable as long as humans have the capability to achieve it. (Singh, 2018). Given what we know about personalized learning and the state of transhumanism today, it would stand to reason that the two seem compatible if school systems can afford the technology and if they can overcome the liabilities associated with innovations in technology. The trend in personalized learning (PL) is to construct an educational experience that is geared towards the strengths and interests of the learner. The curriculum is still the basis for any given course in which a student may be enrolled. The teacher still provides the basic knowledge, but they can do it through video, online learning modules, electronic textbooks, or audio podcast. Allowing students to take in the standards required by the state or district at their own pace and in the learning modality that best fits their learning style has already become prevalent in the form of project-based learning, or PBL. Once the student demonstrates mastery of the basic elements of a learning topic or unit, the student is given the opportunity to construct their own learning experience through self-directed projects, discovery-based activities, and carefully monitored research, both in class and outside of class. Students can demonstrate mastery through alternative assessments such as presentations, performances, papers, and published projects online. No one is suggesting that students will have implants that allow them to receive transmissions or data directly to their cerebral cortex, though some teachers might think this would make teaching easier. In the world of science fiction, teachers would be reduced to purveyors of information through something akin to the Vulcan Mind Meld, giving students an instantaneous understanding equal to the teacher’s own command of the subject. This scenario is not on the horizon in the near future. But imagine a school where every desk was equipped with a laptop or Chromebook built into it. Students would bring their own personal devices like smartphones and connect them via high-speed wireless USB to the laptop on the desk. Any files that need to be submitted would be downloaded to the station’s laptop, which the teacher can access through the classroom’s wireless network. Teachers would be able to access any student’s station at any time, and in the style of Google Classroom, assist the student in developing written, audio, or visual content in real time. Rather than looking over their shoulder, teachers will check revision histories, leave comments, offer direction, and provide sources through the school’s network as students create their product. This kind of personalized learning is already taking place, but a school system must be willing to invest in the technological infrastructure needed to make the experience equal for each student no matter their economic background or social status. Even today, students who want to accelerate their learning schedule are able to register for online courses through their school system. The student moves through interactive learning modules by completing the online activities that provide the basic knowledge. Then students are asked to complete a variety of warm-up, application, and assessment activities that they submit asynchronously to an instructor, who then provides feedback for the student. If the student needs multiple opportunities to be successful, the instructor can offer a mastery-learning approach until the student demonstrates they have achieved the criteria outlined in the online rubric. Students can increase interaction with the educator as well as other students taking the course by posting comments to a discussion board, engaging in a conference-call-style discussion, or by using Skype or Facetime to interact with each other in real time. More students will augment their “brick-and-mortar” school experience with asynchronous virtual high school courses as long as school systems develop their course content to meet the demand for online courses. The challenge is to provide the detailed content and rigorous coursework that students would receive in the traditional classroom. Teachers often complain that education as a profession is subject to numerous fads and trends that seem to come and go. Some trends become more institutionalized than others. The role of technology in education cannot be denied, and those teachers who have resisted change tend to either leave the profession or retire, though many find the same trends reflected in the world of business and industry. In 1970, futurist Alvin Tofler published Future Shock, where he forecasted such current day phenomena as the free-flow of information through the Internet and the possibility of telecommuting in a business model that contained no formal structure. Today the role of computers, information technology, the Internet, and social media must be integrated into more traditional approaches to teaching as i ncreasing mechanization revolutionizes learning both inside and outside the K-16 classroom. To what extent individualized, downloadable, multisensory, and self-paced learning will be tomorrow’s future is up to the flexibility and willingness of educators to adapt, achieve, and grow within their own profession, resulting in a fuller, more personalized learning experience for every student. Education Week, “Personalized Learning: A Working Definition.” https://www.edweek.org/ew/collections/personalized-learning-special-report-2014/a-working-definition.html, available, 2018.